A peacock’s call shatters the silence of the early morning. It’s 6am and I am standing in that half-light that comes just before the sun raises its head above the horizon. A river flows gently past to my left and there is a nervous shuffling as 700 people gather for the start of the 8th running of the Kaveri Trail Marathon (KTM). The race director’s last minute announcements are interrupted by a spontaneous singing of “Happy Birthday” somewhere in the crowd prompting a proud mother to climb up onto the podium and grab the microphone. “It’s my daughter’s birthday today too” she cries out, “please sing for her as well”. The crowd breaks out into another “Happy Birthday” for the daughter who hides in the crowd and doesn’t raise her hand when the race director asks her to identify herself. As the large digital clock ticks over to 6.30, we set off up the dirt path, red bibs pinned to the chests of those running the half marathon, blue denoting those running the full. All shapes and sizes are here today, lean fit looking runners accompanied by less athletic looking entrants tackling this distance for the first time. Many have made the 3-4 hour journey from Bangalore to run a race that has become known for the beauty of the course, following as it does the meandering path of a tributary of the River Kaveri, a major water source for the state of Karnataka. 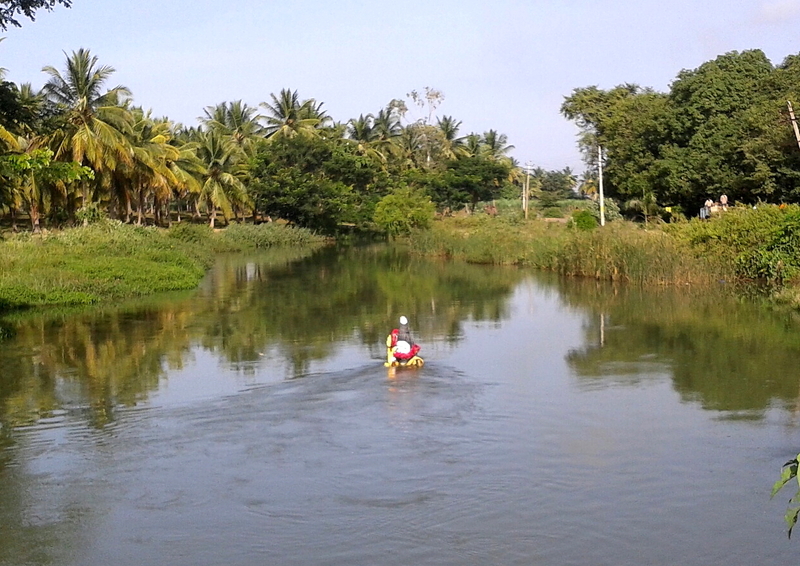 Starting as we do, near the entrance to the Ranganthittu Bird Sanctuary, the route teems with birdlife. To the right of the trail are lush sugar cane fields and even at this early hour, farmers get to work tending their crops before the heat of the day makes the task unbearable. The field spreads out, stray dogs standing on the edge of the path in bewilderment as scores of runners trudge past. Farmers in their white lungis and vests taking a break from their work to watch and wonder as people from all over India and the occasional westerner, run by. A sea of green t-shirts surrounds me, emblazoned with the logo of Amazon India, a company which either encourages running amongst their employees, or has thought of a novel way of marketing themselves. Finding my rhythm, I feel a little smug and self-satisfied, running as I am in minimalist shoes as others tread on in their heavily cushioned “traditional” running shoes. That is, until a young man rapidly passes me, his bare feet padding rhythmically on the sun-baked earth below. Catching up with him, we chat for a couple of kms about our experiences of transitioning from shod running to barefoot running. I congratulate him on going the whole hog but we eventually part ways when he pauses to remove some large thorns from the sole of his foot. The sun slowly rises above the horizon bringing with it a heat, the intensity of which increases by the minute despite the still early hour. I sip a few mouthfuls of water at the well-stocked aid stations but ignore the trays of bananas and fruit, knowing that if I stop for too long, the voices in my head telling me to give up might become too powerful. 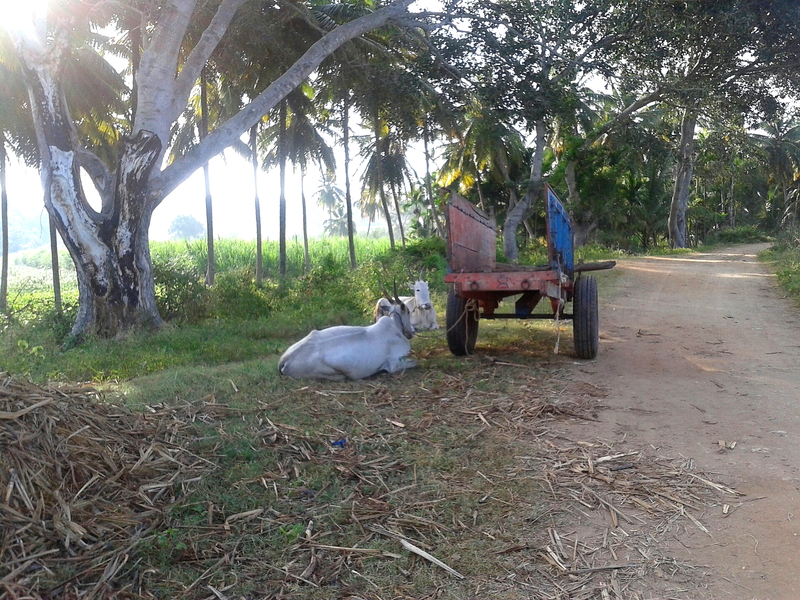 Bullock carts laden with harvested sugar cane occasionally block the way on their way to the market forcing me to either stop for a moment or detour into the long grass. Ahead some small village boys, already dusty from playing in the fields, offer runners sweets with outstretched hands, grinning with excitement while the stray dogs, earlier standing sentinel beside the path, have retreated, still puzzled, to the shade of the banyan trees. The last few kms pass in a blur, the beautiful scenery which had enthralled me on the outward leg, no longer grabbing my attention, as I look only for the next distance marker and the next patch of shade. 2 hours after starting in the cool light of dawn, I cross the now sun-baked finish line, a proud sense of achievement dispelling all feelings of exhaustion. Someone hangs a finisher’s medal around my neck, and I turn to shake the hands of those who finished with me. Spying a “nariyal pani wallah”, his bicycle laden with coconuts, I head towards him and down in quick succession the water of two young coconuts, nature’s best electrolyte replacement drink. This was my first ½ marathon in over 20 years and I am happy that I chose the KTM to run this distance again. The running community worldwide is a friendly one but the relatively small number of runners at the KTM lends a camaraderie to the event I haven’t felt on larger runs. 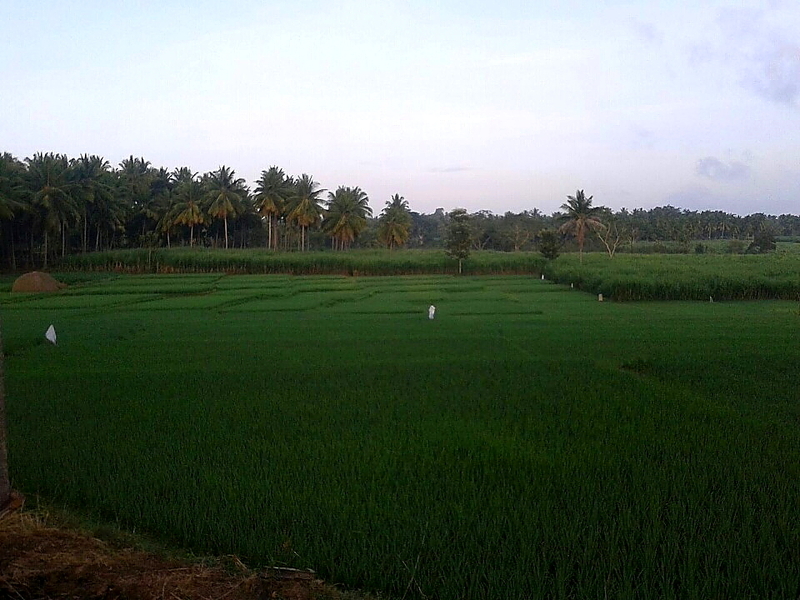 That coupled with the beauty of the course, the peacocks, the bullock carts, and the locals lining the course make this event unique and I know that this race will always hold a special place in my thoughts. I will be back next year. I grin but can’t think of a suitable answer. Only another runner would understand. 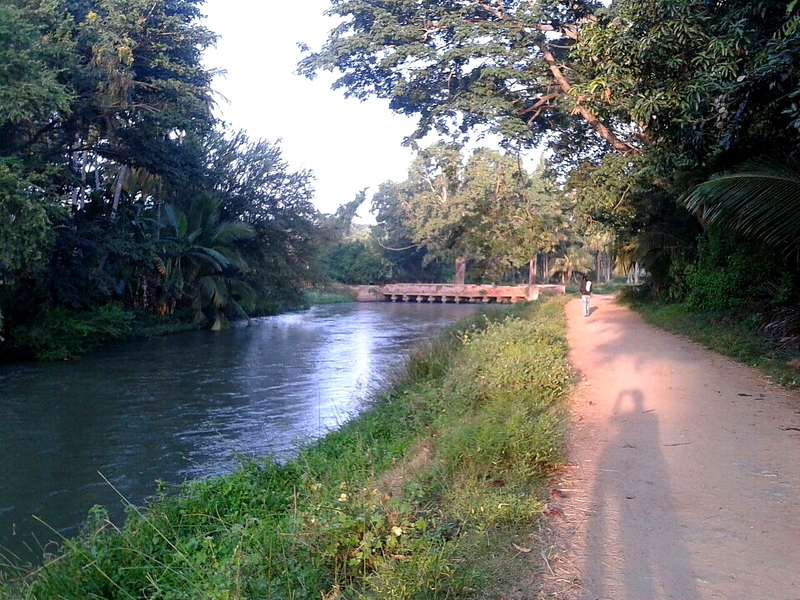 This entry was posted in Bangalore, India, Karnataka, Life, Running and tagged Asia, Bangalore, Expat, India, Karnataka, Life, Marathon, Running by Kiwigypsy. Bookmark the permalink. Thank you. Yes it was a great experience.Much more fun than a road course. I enjoyed your writeup too. What are you running next? I am doing the Javadhu Hills Ultra. Some lovely images. I miss the red earth of Karnataka. And the smell after the rain! Enter your email address to receive new posts by email. Its free and it boosts my ego!